«Back to We Kan! Attendees for the 2019 BRB: Network It! Home | Our Programs | We Kan! 2019 Big Rural Brainstorm: Network It! March 19, 10 a.m.-4 p.m.
We are full! If you would like to be placed on a waiting list, fill out the registration form and we will contact you in the order it was received. Optional Warm-Up Round, 9 a.m.
Click here to see who is coming and who is sponsoring (we love our sponsors!). Link to first e-blast announcing the BRB: Network It!. 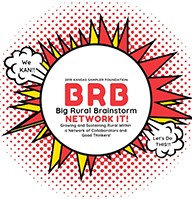 The purpose of the 2019 "Big Rural Brainstorm: Network It", a project of the Kansas Sampler Foundation, is to utilize networking to answer any type of question about community or business in rural Kansas. Community volunteers, doers, leaders, local government and business owners and rural advocates from state agencies and other community-supporting organizations will be there. It's an unconference. There aren't break-out sessions with speakers like at the We Kan! Conference. Everyone will have the opportunity to have a voice (introverts, just be you). Your "voice" might be heard by you posting on a sticky note, sending an e-mail ahead of the conference, checking a box on the registration form, or speaking up that day. If you are coming to the BRB, we would LOVE to hear from you NOW about what you'd like to see addressed. At the BRB, we will bring together those with the same questions you have and mix in people who have maybe found some solutions through experience. Throughout the day, we'll change the form of the groups and give you an opportunity to hear numerous ideas and responses to other questions. You might even be able to help someone else. That is what a network is. You ask, you give. We help each other. Questions? Contact Marci at marci@kansassampler.org.